Chrome is an excellent web browser alternative to Safari on the iPhone, iPad, and iPod touch, and if you use the Chrome app you’ll probably want to know how to clear out the common browser data that gets stored locally in iOS. This includes data like web caches, cookies, site browsing history, and possibly saved login details and passwords. Unlike clearing cache and browsing data from iOS Safari though, you won’t find Chrome’s options in the wider Settings app, and instead they are contained within the iOS Chrome app itself. That difference is fairly common with default Apple apps vs third party apps, but by no means does it indicate complexity, as clearing out browser data in Chrome for iOS is simple. 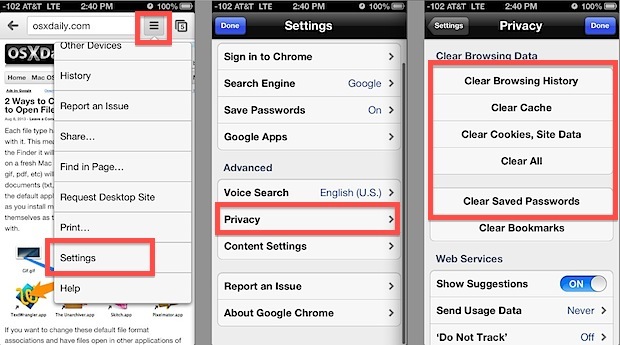 This can be used to clear Chrome browser cache, history, cookies and site data, or all web data in Chrome for iOS. It is the same with each version of the Chrome iOS application. Clearing all data is a simple way to regain some privacy of browsing habits. This is particularly important if you share a single iOS device with others and you want to keep something secret, like vacation research or gift ideas, since without clearing the data someone may be able to recover those browsing activities by viewing history in the browser. Removing cookies and saved passwords is equally important, since web site login details may be stored that way for private accounts, be they for Facebook, Amazon, or web mail. At the moment, Chrome does not offer the ability to delete cookies just for specific sites, which is something that Safari does allow, so you’ll have to clear them all instead. Another benefit to occasionally trashing all that locally stored data is that you may be able to free up some space on the iOS device by doing so. Caches can add up over time and accumulate on the device, becoming a portion of the commonly misunderstood “Other” data that takes up space on the iPhone, iPad, and iPod touch. This is why deleting and reinstalling some apps can help to remove that Other data or at least slim it down, but with Chrome’s ability to directly clear out it’s own local data it prevents the need to do so with the Chrome app.